Two members of the WXtreme Chase Team, Walt Gish and Eugene Thieszen departed Cordell at about 10:00 am for an initial staging point of Medicine Lodge, KS with a brief stop in Enid to pick up Jason Caster. The third chase team member, Eric Sipes, traveled with John Hall and Ashley Mills for more or less the same target area. While on the way a PDS tornado watch was issued for the target area and storms began to develop NE of Meade, KS and move toward the Bucklin area. There were reports of some brief tornadoes with those cells. So, instead of staging in Medicine Lodge as planned, we headed toward Coldwater to refuel and strategize. 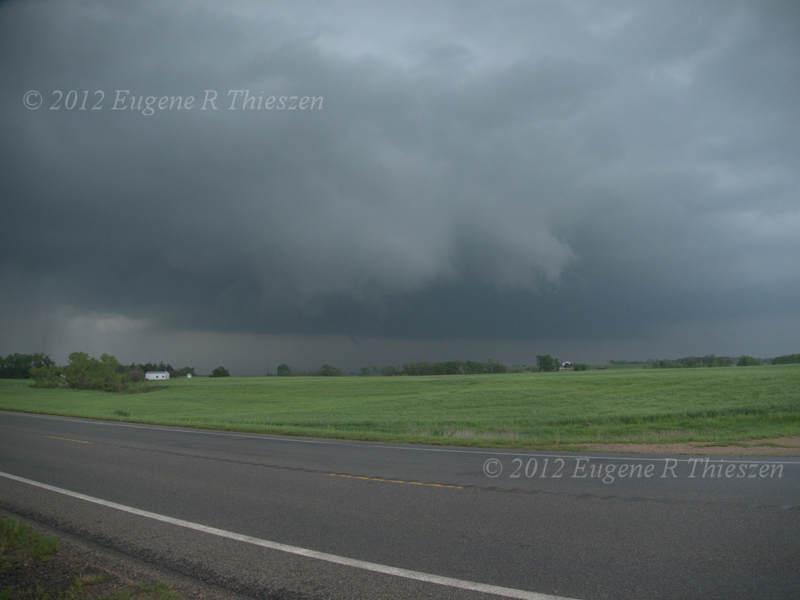 By that time a new supercell was ongoing to the S near the Oklahoma border so we headed E along US 160 to intercept it on its NE course. Setting up on the Aetna Road, we observed its approach. It developed a large wall cloud and perhaps a few brief funnels, but no tornado seemed imminent. 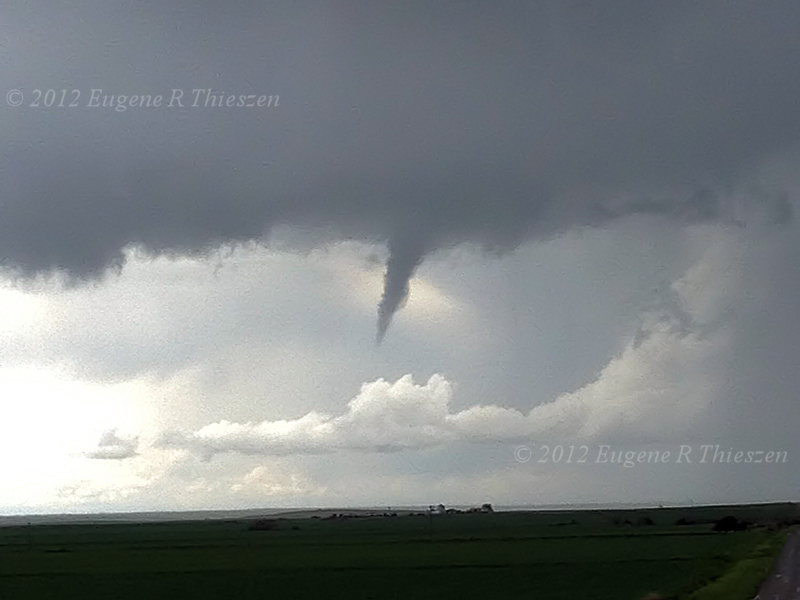 We stayed with the storm heading up toward Lake City and just N of town witnesses a brief, weak tornado that was not much more than an organized circulation in the rain curtains. After allowing the storm to cross the road to our N and observing another possible tornado on the edge of the rain about 5-7 miles to the NE, we let the now fast-moving storm go and headed toward a position S of Medicine Lodge to intercept yet another tornado-warned supercell approaching from the Oklahoma border area. The mesocyclone cycled through periods of moderate, cloud-based rotation, but was unable to produce much more that brief funnel clouds and occasional weak circulation on the ground below. We continued with the storm until N of Zenda and at that point elected to abandon it and took aim on a pair of supercells in northern Oklahoma. We arrived at an intercept position at about 7:45 CDT and set up along US 64 just S of the SR 11 junction to wait for the southern-most supercell to come to us. 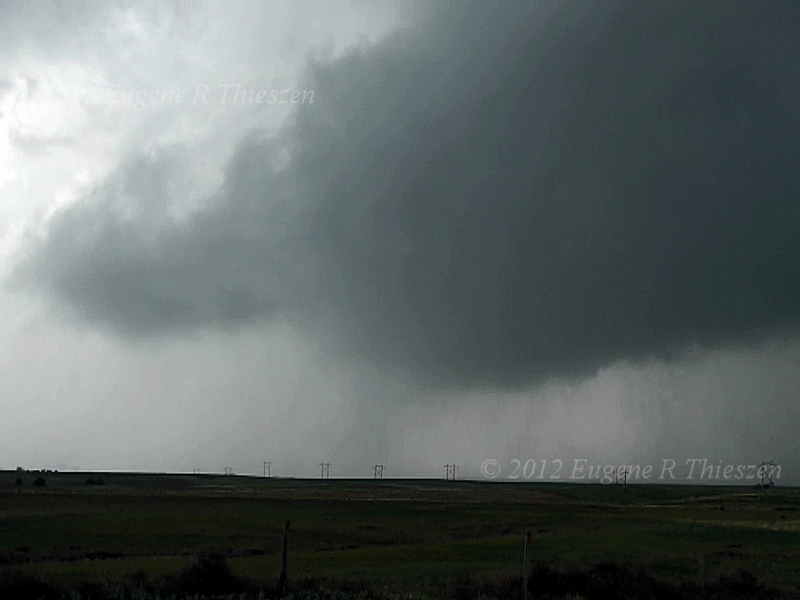 A large lowering with a reported tornado but no visible condensation was approaching from the WSW. Eventually a tornado condensed in the distance. 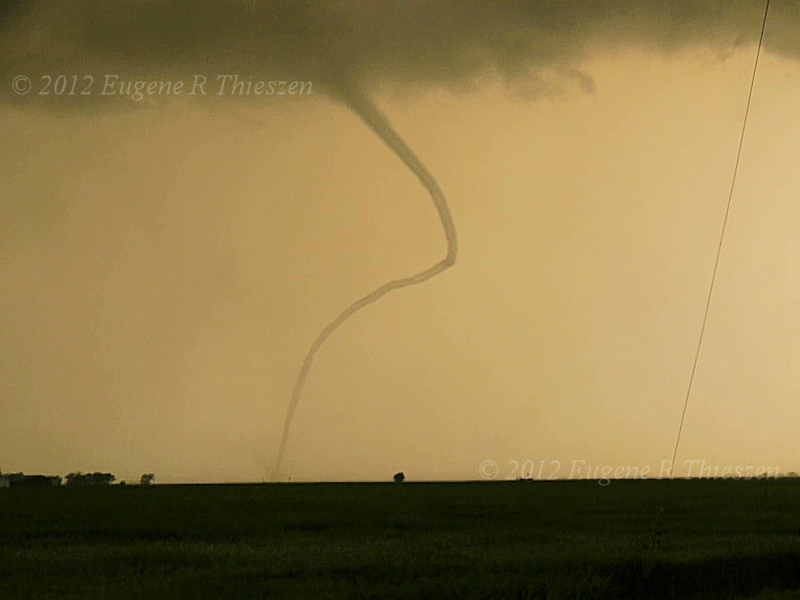 The tornado grew in size transitioning through a truncated cone stage eventually becoming a substantial stovepipe. 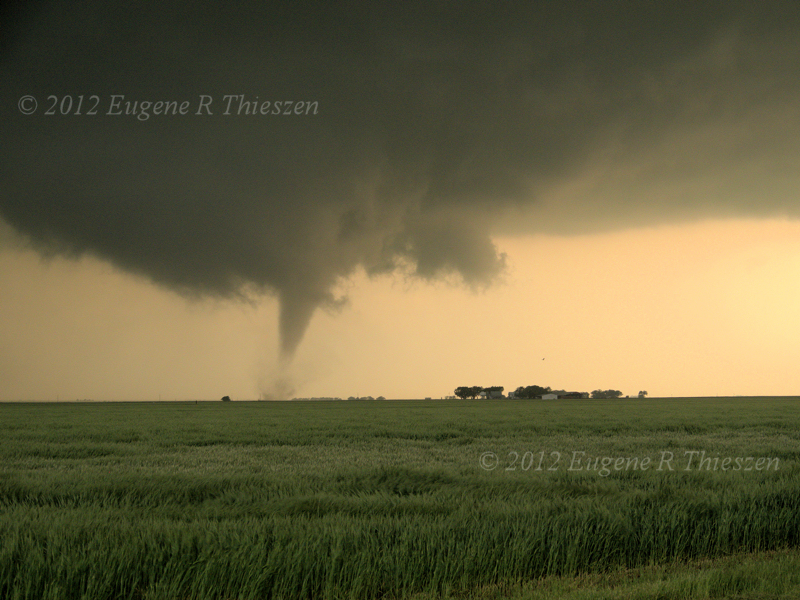 After a few minutes passed, another wall-cloud developed closer to our position and quickly produced a second tornado. What a sight to behold! 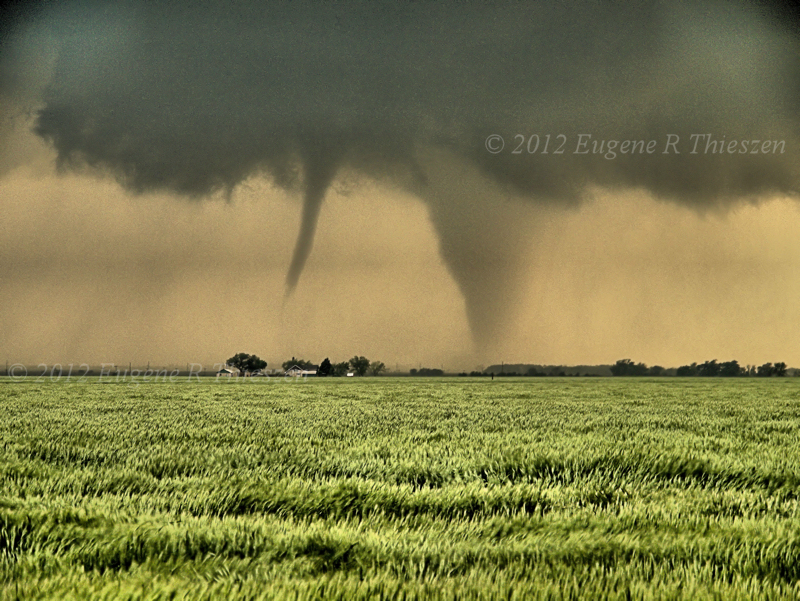 From our perspective they looked to be quite close together, when actually they were several miles apart. 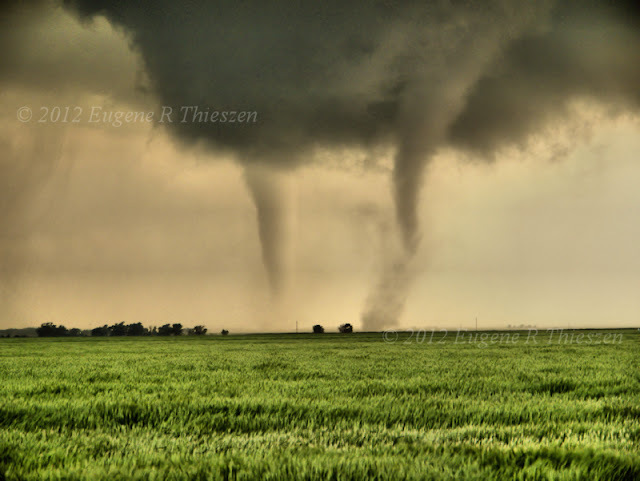 At this point the larger, stronger tornado began to quickly shrink in size as its mesocyclone occluded and the second tornado gained strength as it moved rather quickly NNE. 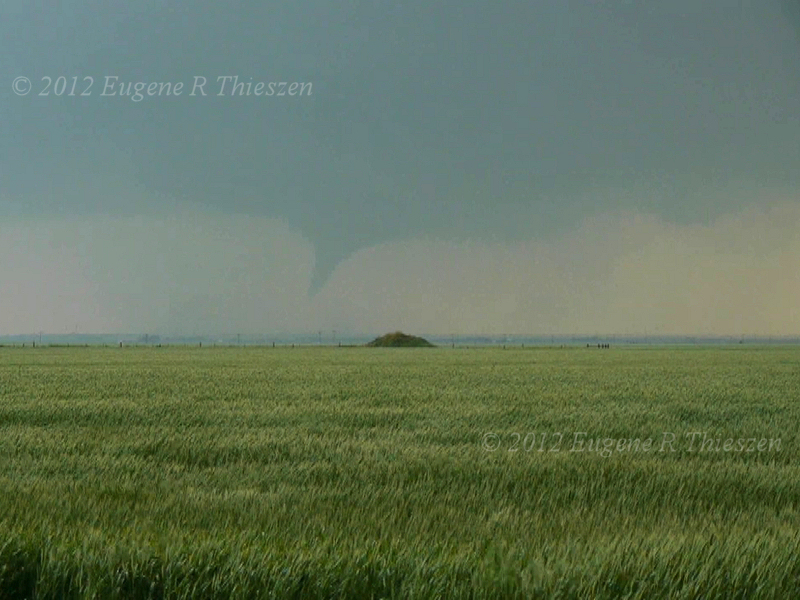 The approach was so close that on the video you can see the bushes on the far side of the yard bend toward the tornado! 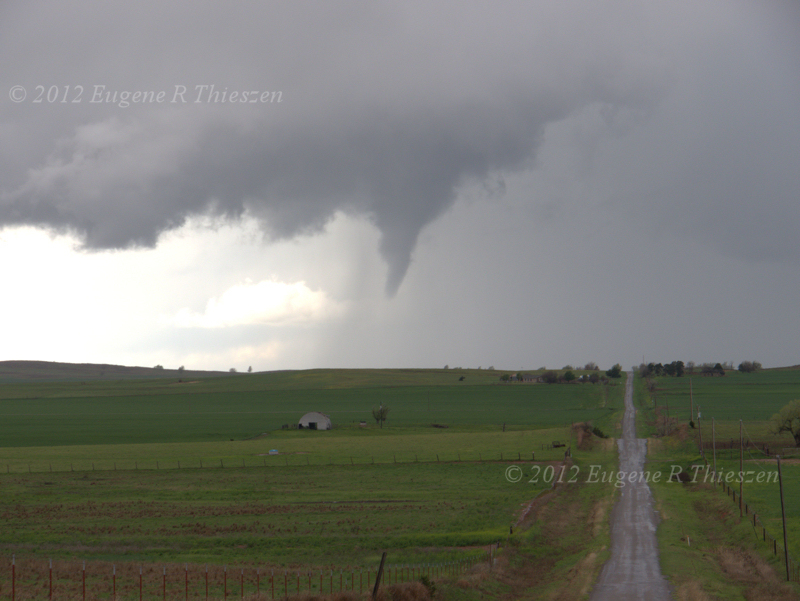 As it continued on it destroyed an outbuilding just N of US 64 eventually crossing the road about a mile N of our position. 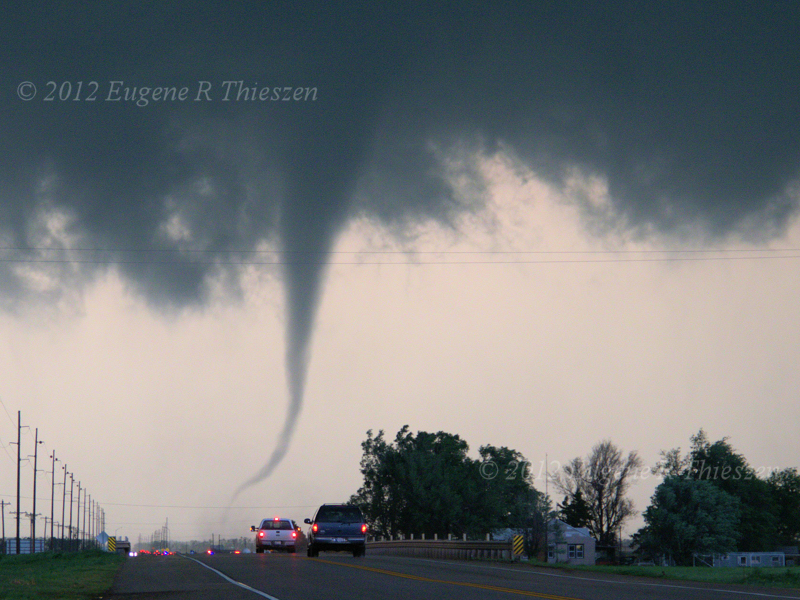 At this point we headed east on SR 11 as the tornado continued on NNE and eventually dissipated as we were about to lose sight of it. 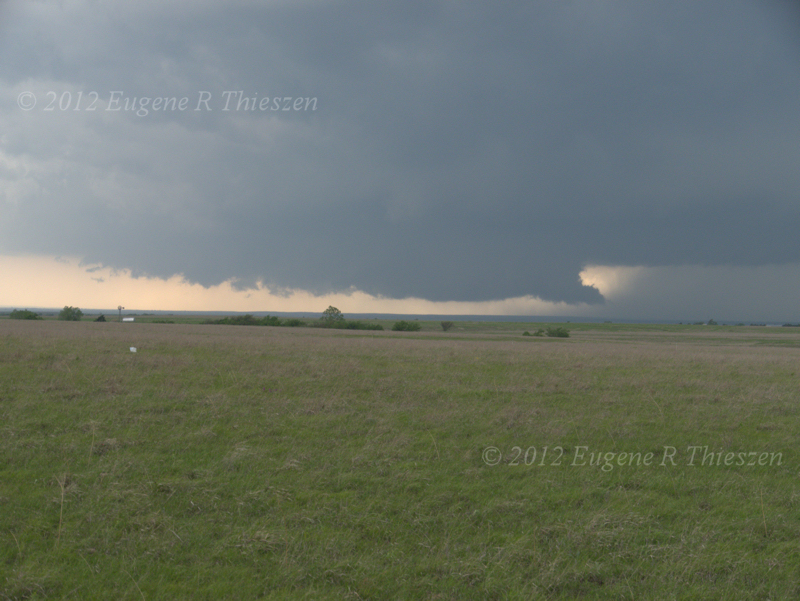 Another quickly formed and we drove N of CR 2720 to get a closer look as darkness fell. A fat stovepipe crossed the road a mile or two ahead of us, backlit by lightning and when we reached the damage path with down branches and powerlines we called the chase. 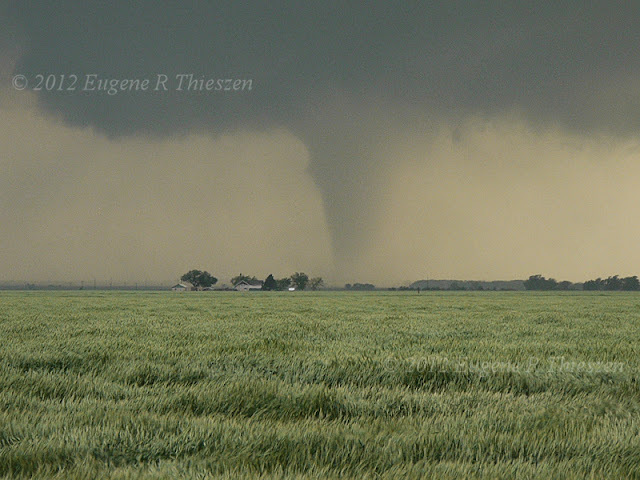 The storm continued on and produced a series of tornadoes, one of which did EF-3 damage on the SE side of Wichita, KS at about 10:30 CDT.